June 14, 2010 -Ken Keith, owner and CEO of Extra Aircraft and Walter Extra, company founder announced the availability of Extra’s new Rolls Royce powered, six seat pressurized 500 Spirit turbo prop in North America. The product of nearly thirty years of building and certifying world champion aerobatic aircraft, the Extra 500 Spirit benefits from aerodynamic shapes only achievable with carbon fiber composite construction. The use of carbon fiber has resulted in a lighter, larger cabin for the 500 Spirit than its competitors and permitted the use of the 207 pound Rolls Royce engine. The combination of airframe design matched with the efficient Rolls Royce engine has produced the most well balanced turbo prop to date with a fuel burn of just nineteen gallons per hour and a range of sixteen hundred miles. The Extra 500 Spirit is the first OEM aircraft to incorporate Avidyne’s new state of the art Entegra II Release 9 avionics system with a powerful FMS (Flight Management system). The system offers worldwide satellite weather, active traffic display, infra red forward vision, lightening detection, and charts. 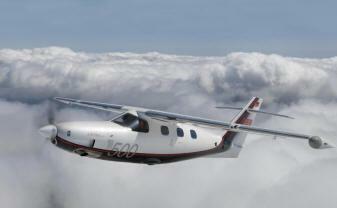 Stepping into Turbo Prop Business Tourer an EA-500 is stepping into luxury. The impressively large six-seater cabin makes traveling the ultimate experience in comfort, and an ergonomically arranged cockpit and state-of-the-art avionics ensure that you have the best at your fingertips. It’s also one of the smartest investments you’ll ever make. Our engineers have found that perfect balance of power and weight to make the advanced carbon-fiber EXTRA 500 the most cost effective single-engine turboprop aircraft available. Extra has appointed three outstanding Extra Aircraft Sales Centers for its North America customer sales and support. Mid Island Air Service on Long Island NY for the northeastern quarter of the US. Contact Vince Basile, Premier Aircraft Sales of Fort Lauderdale FL, USAero LLC of Denver CO. The Extra 500 Spirit will be on tour at major cities in the US from June 16th until August 1st 2010. You can follow their tour progress by going to extraaircraft website.